The other day, something that never happens, happened. Both of my girls napped at the same time. It was amazing. I almost didn't know what to do with the extra time I had. I decided to go through some old journals and read my scriptures. Two things that I don't get to do often at all. While I was looking through my journal, I found a little journal program that I'd started a while ago. It slowly faded away after having M because sleep was more important that writing in a journal at that point. 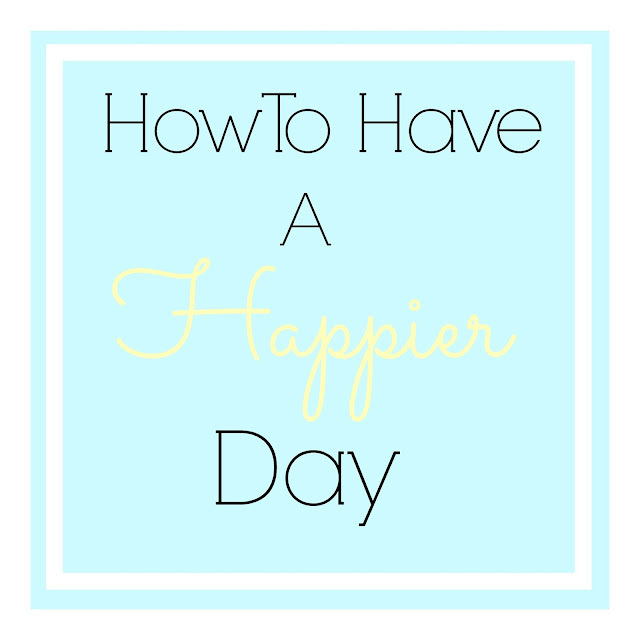 I had found an article on Pinterest called 10 Ways to be Happier in Your Own Home. There were a few of the tips that I took and used in my life. I started the day with an intent, I'd pray every morning to help me live that intent to the fullest for that day. I always make my bed so that was a given. I started a journal, although instead of a one line gratitude journal, I wrote about my intent and then I found highlights of my day to add too it. I made an effort to call one person a day. Because talking to an adult at least once a day, really helped my sanity. I made sure that every room I left was clean. This also helped my sanity. It made me a happier mom. 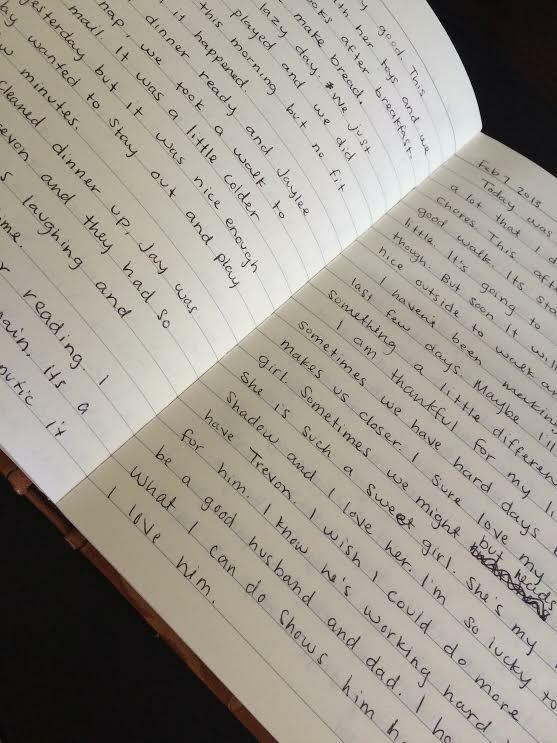 By writing this all in a journal it kept me accountable. I felt the need to do it so that I could see God's blessings in my life. The problem was that I stopped doing all these things. Maybe I don't need to write them down in a journal every night, but I do need to start working on all of these little things again. It's amazing how many more good days you have by doing this kind of programs (if you want to call it that). Lately, my house is a mess. I feel like I can't keep up somedays. My days go on with out real meaning because I don't set an intent. And I fail to notice all the good little things, the tender mercies, in my life. I also noticed, while reading the journal, that J had been just as hard as M is starting to be as an almost 2 year old. Isn't it interesting that we forget those things? We remember that they were hard, but we don't remember every little thing. Like when J would puke because she threw up so much. That's not something I've forgotten, but it's something I read and was glad, and reminded that I'm blessed, that M doesn't do that. I was reminded, too, of how great it is that Trevon's job doesn't require him to work evenings anymore. It's really nice to have him home at nights to help put the girls to bed. Make your day meaningful by having setting an intent for the day. Something you want to get done, or work on. Write down what you're thankful for and what your highlights from the day are. That way on the bad days you can go back and remember that you are blessed. Clean your house. It's amazing how happy walking into a clean room can make me. What are your favorite tricks to help you have a happier day? I love the idea of writing what you're thankful for each morning. I have a 5 year diary where you write one or two lines a day for 5 years (the days are stacked, so five entries per page.) but i usually fill it out at night. Maybe I'll start doing it in the morning to remind myself of the good things that happened the day before! It's great how finding the things you're thankful for in life can change your whole day. The idea of setting your intent every day is great! I feel like that would help me have a more purposeful day. 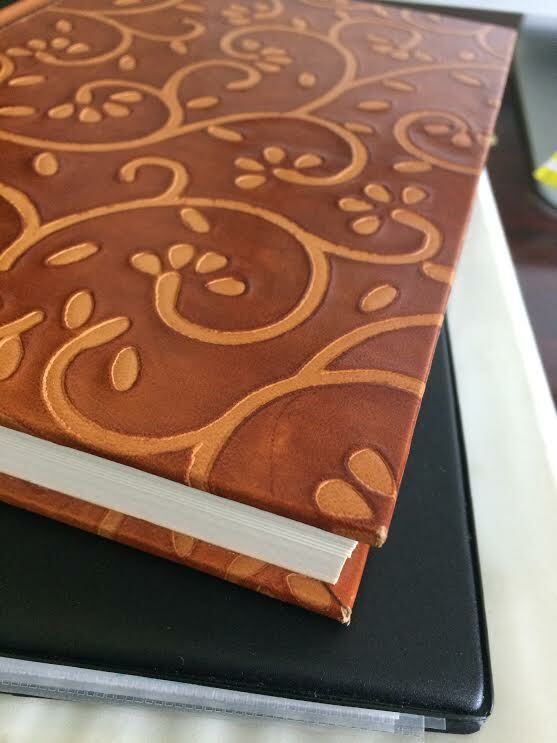 Aren't journals wonderful?! I love looking back at mine. It's always neat to read something you wrote that you forgot had happened! I hope you have a happy friday and a happy weekend! Setting an intent was so great for helping me feel like I was accomplishing something every day. Even if the intent was just to be a fun mom or to get out of the house or something like that, I felt like it was one thing that I knew I needed to focus on that day and I always felt like I accomplished it. One thing I really like about journals...or I guess this journal, was that now I'm able to look back at it and remember that my oldest acted the same way my almost 2 year old does now. It makes me feel like it's something I can handle. Cleaning the house is a big one. It doesn't have to be mopped and stuff, just not cluttered. I get crabby if I'm in a messy place. Which I almost always am, but that's beside the point. Yes. The mess is always the tipping point for me. I'm such a better mom and wife when the house doesn't have toys all over the place. And stacks of crap. Cleaning the house is sanity for all of us. Thanks for the great post! So inspiring! I try and think of scriptures every day so I can have that comfort. I try and do small acts of service so I can brighten up someone else's day, even just a smile! Thanks for reading. We actually taught a lesson on journaling today in our class. We miss teaching you guys, I hope you're enjoying your teacher now though. You're such a great girl! What a great idea to think of scriptures or do service to help you have a better day. Isn't it great that doing those things do help? Thanks for reading!